The Moray Business Women (MBW) were very pleased to be able to present Moray Food Bank, their selected charity for 2017, with a cheque for £6,500 at their annual Charity evening last week. The cheque was presented by incoming President Sharon Whitley along with members of the 2017 Committee. Throughout last year the ladies held various events including the Moray Business Women’s Ball to help raise funds for the charity. Raffle sales also went towards the total. Each year the members of MBW select a charity to work with throughout the course of the year. Working closely with the chosen charity they put their efforts together and campaign to raise awareness for the charity and funds. 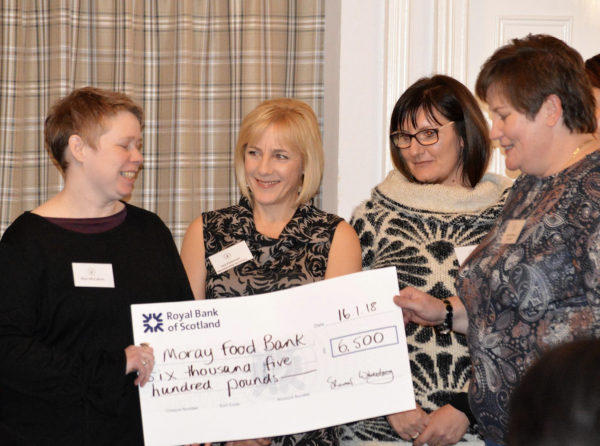 Moray Food Bank gratefully accepted the cheque at the Charity event and vowed to remain members of the Moray Business Women because of the great networking opportunity it provides.